There is strong evidence that Health Care Providers can make a difference in helping their clients quit. Unassisted quit attempts are successful only 3-5% of the time, compared with up to 20% success for those receiving cessation counseling and medications. Cessation interventions are now considered to be requisite duties of many health care professionals. It only takes a few minutes to make it happen. Recognized internationally as a best practice in tobacco cessation. Advocated for in many clinical best practice guidelines. Supported as effective through a number of studies and meta-analysis. 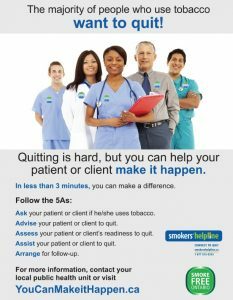 The You Can Make It Happen toolkit, Integrating tobacco cessation interventions (5A’s) into your daily practice will outline how to use the 5A’s to ensure that for every patient, at every visit, tobacco use status is queried and documented. Send The Right Message is a LGBTQ Youth Initiative campaign with the goal to encourage straight and cisgender youth to challenge every day instances of homophobia, biphobia and transphobia. Rainbow Health Ontario works to improve the health and well-being of LGBTQ people in Ontario, and to increase access to competent and LGBTQ friendly health care services across the province. This is done by providing education and training to providers, advocating for public policy change, sharing information and consulting with service providers and organizations. The Clear the Air project came about because smoking rates in the LGBT communities are much higher than those among the general population. The purpose of this project is to raise awareness about smoking in the LGBTQ communities and to ultimately make the community healthier by decreasing smoking rates. The 519 is committed to the health, happiness and full participation of the LGBTQ community by making a real difference in people’s lives, while working to promote inclusion, understanding and respect. The 519 offers resources, education and training and other forms of community support. A gender identity and gender expression toolkit to support the implementation of institutional and social change. This research team is made up of lesbian, gay, bisexual, transgender, transsexual, Two-Spirit, and queer (LGBTQ) and ally researchers who focus on understanding how LGBTQ people experience physical and emotional (mental) health, and how they access health services. The Youth Line is a toll-free peer-based phone support line created to assist lesbian, gay, bisexual, queer and questioning young people across Ontario. The CDC provides information and resources on some the health issues and inequities affecting LGBT communities. Links to other information sources and resources are also provided. The Registered Nurses` Association of Ontario invites all nurses, nursing students and other health care professionals to attend a FREE one day workshop on Smoking Cessation Best Practices! Training Enhancement in Applied Cessation Counselling and Health (TEACH) Project provides training for health care professionals in the public, private and non-profit sectors who provide intensive counselling services to people who use tobacco. Practitioners who are TEACH trained in Ontario can become certified by the University of Toronto in the delivery of intensive tobacco cessation interventions. TEACH is accredited by the College of Family Physicians of Canada Main-Pro C, Canadian Addiction Counselling Certification Federation and the Ontario College of Pharmacists. 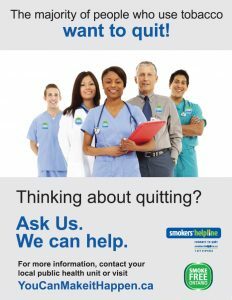 FREE interactive web-based courses aim to help health-care professionals learn simple and effective techniques to talk to their patients about smoking cessation. OTRU’s online course, Tobacco and Public Health: From Theory to Practice features accessible, comprehensive and evidence-based Canadian content that is geared to individuals working in tobacco. In addition to the on-line Dynamic Guidelines for Tobacco Control in Canada, CAN-ADAPTT hosts a Guidelines Discussion Board, inviting health care providers to make comments on how these recommended practices may or may not work in their setting and provide suggestions and/or evidence of what practices have worked for you or may work when treating tobacco dependence. Based on the book Motivational Interviewing: Helping People Change (Third edition, 2013), this simulation-based and interactive online course is designed for health care practitioners who have direct client care responsibilities. This course offers 44 hours of training on how to use core motivational interviewing skills in conversations about change across a range of health-related issues. This course will focus on teaching the principles and spirit of MI to help practitioners develop skills to guide their clients through the change process. This workshop is an intensive introduction to Motivational Interviewing with movement to an advanced level of competency in understanding how to implement and sustain Health Behaviour Change for your clients, your programs, and overall practice. The Registered Nurses’ Association of Ontario invites nurses and other health-care professionals to attend FREE knowledge exchange webinars to learn more about smoking cessation interventions within specific populations groups and other smoking cessation topics. This monthly seminar series is designed for physicians, Family Health Teams (FHTs) and other health/allied health practitioners to enhance their knowledge and skills in offering cessation interventions. Physicians, Physician Assistants, and Nurse Practitioners can earn Continuing Medical Education (CME) credit through their New York State Tobacco Cessation Centers. Healthcare Providers Tools for Treating Tobacco Dependence including online CME course. Provides ongoing Tobacco Treatment Specialist (TTS) Certification as well as free online courses. Online continuing education courses covering a range of topics relating to advances in addiction treatment and prevention. Courses relevant to tobacco use cessation include: Addressing Tobacco Use and Dependence in Addiction and Behavioral Health Services; Motivational Interviewing: Fundamentals; and Motivational Interviewing: Encouraging client change and rolling with resistance. Tobacco Informatics Monitoring System (TIMS). Innovative web-based application designed to provide easy access to reliable, up-to-date data on key tobacco control indicators. Common measures and definitions are provided to ensure equivalent reporting by service providers. Key data standards and definitions are provided in this document for adult (18 years of age and older) tobacco users participating in smoking cessation programs. 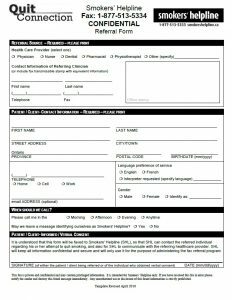 These data standards/questions and definitions can be utilized when creating your patient assessment forms. Treating Tobacco Use and Dependence: 2008 Update. Clinical Practice Guideline.